After the Trader Joe’s spoof, I didn’t think I’d be spotting tikis on “The Simpsons” for awhile. 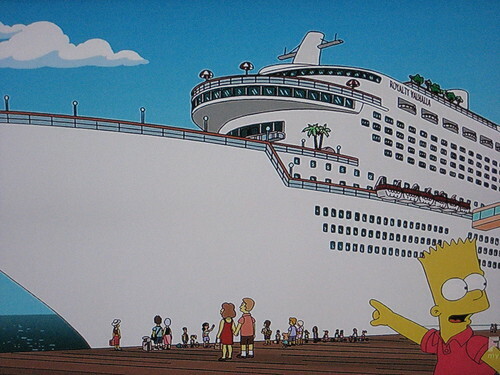 But I was proved wrong by the episode “A Totally Fun Thing that Bart Will Never Do Again,” which aired on April 29. 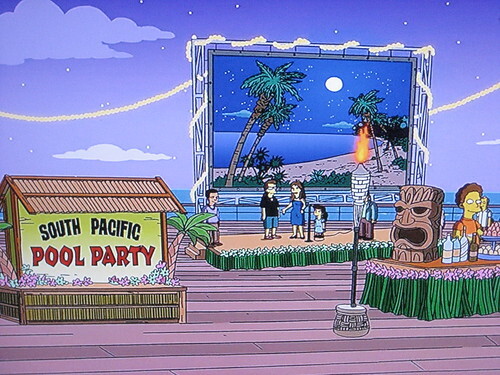 The Simpsons take a family vacation on a cruise, and the ship hosts a South Pacific Pool Party complete with a beachy backdrop, tiki torches and a tiki table centerpiece that looks sort of Mayan to me (though I’m no expert on pre-Columbian sculpture). 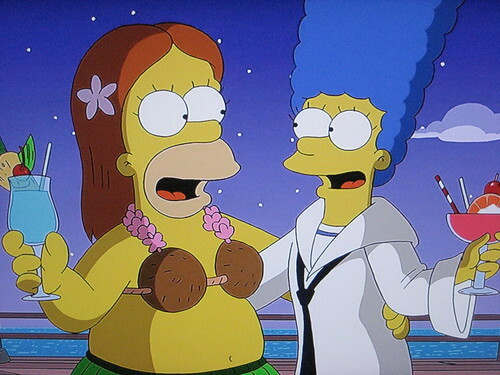 Earlier in the episode there’s a musical number with the lyric: “Here Hawaiian shirts are cool; back home, well, not so much,” while later the disgraced cruise director laments, “After this I’ll be lucky to get work on a clothing-optional Jimmy Buffett cruise.” Leave it to “The Simpsons” to go for the clichés. Well, at least they didn’t refer to tiki as tacky. 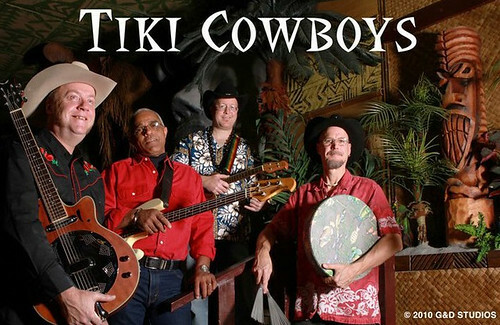 Until recently, the only connection I knew of between “tiki” and “cowboys” was a famous little tune called “Hawaiian Cowboy.” (I remember it from “The Muppet Show,” but according to legend it was composed off the cuff by Solomon K. Bright in 1936.) In further researching these seemingly unrelated subjects, I also discovered that Hawaii’s history of cattle wrangling actually goes back before the heyday of the Wild West in America. 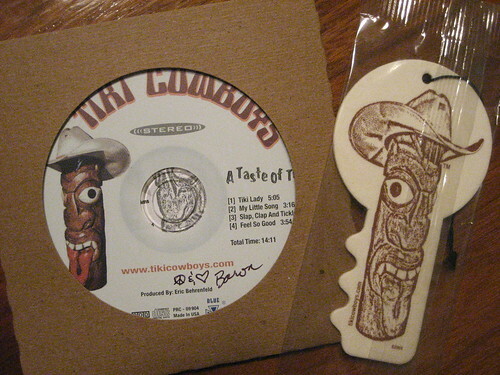 Anyway, this is all a roundabout way of introducing Eric “Baron” Behrenfeld’s band: the Tiki Cowboys. He sent me a copy of his 2009 debut EP “A Taste of Tiki,” on which Baron was a one-man band, supplying vocals, ukulele and percussion. 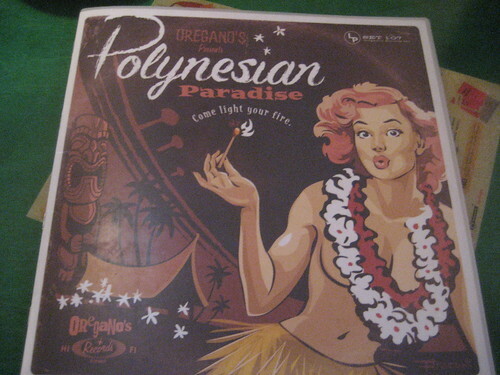 Of the four original songs, the first track “Tiki Lady” is my favorite. It’s upbeat and fun and has some suggestive lyrics (ooh la la!). “My Little Song” takes on the country music trope that goes something like “my dog died, my wife left and she took my truck.” “Slap, Clap & Tickle” is a syncopated instrumental while “Feel So Good” brings in some elements of surf music. Sharp eyes might recognize the setting in that first photo as the Tiki Terrace in Des Plaines, which is where Baron and the other musicians that make up the Tiki Cowboys perform live every third Thursday from 6 p.m.-8:30 p.m. Later this year we should also be able to look for a full-length album with more of their “Beach Blues and Tiki-Twang” sound. For more information, check out the Tiki Cowboys Facebook page. 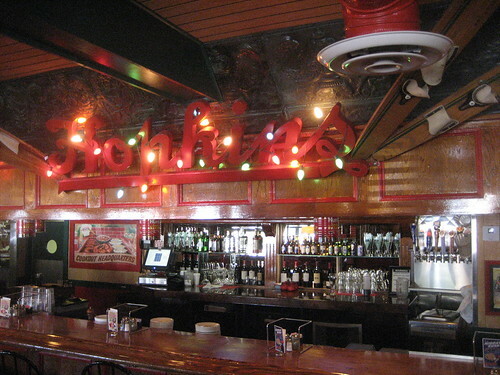 Each of the dozen Arizona locations tries to evoke the feeling of a neighborhood Italian restaurant in Chicago from decades past. 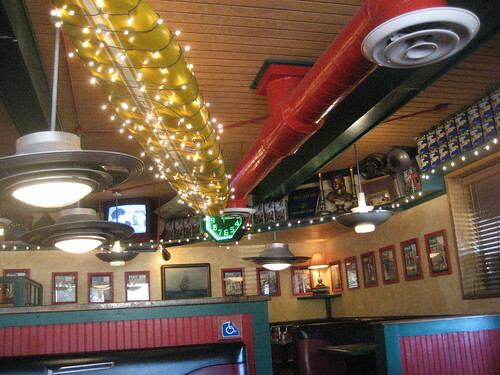 The dining rooms are filled with random kitsch like neon clocks, old wooden skis and surf boards covered with Christmas lights. 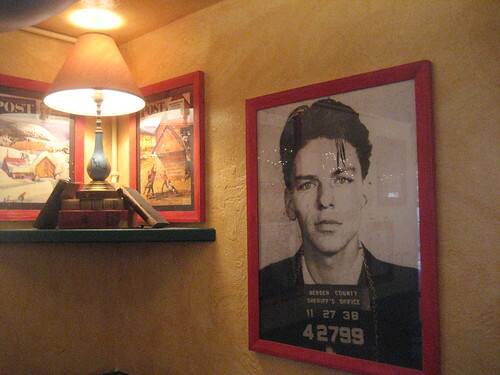 I was a bit surprised to see a mug shot for a young Frank Sinatra framed up on the wall. His crime? 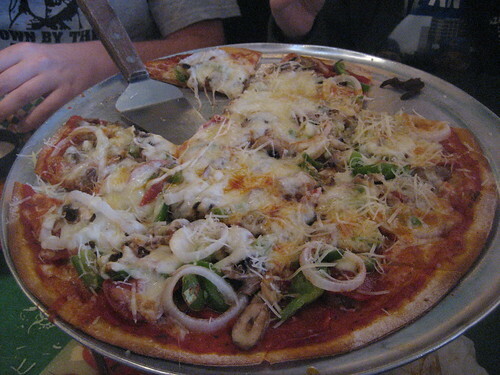 Seduction. 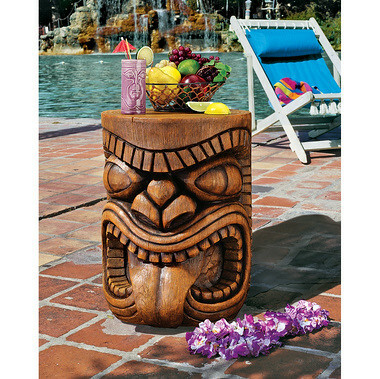 But then I remembered how that catalog has been “inspired” by photos in “The Book of Tiki,” and there it was when I flipped through my copy. 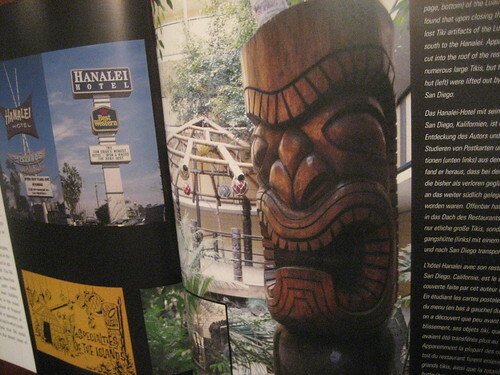 The image illustrated author Sven Kirsten’s discovery that tikis from the original Luau in Beverly Hills somehow ended up at the Hanalei Hotel (now a Crowne Plaza) in San Diego. Double déjà vu!